Although many parts of the country might not yet be seeing snowflakes fly, now is the time to plan your trip to one of the top winter festivals. Here are some of the best and most popular annual winter festivals across the nation. St. Paul Winter Carnival: For the oldest and largest winter festival in the United States, St. Paul, Minnesota is the place to be. Thanks to a reporter for the New York Times all the way back in 1885, who stated that St. Paul was too cold for human habitation, the following year the city held its first winter festival, and it has become a welcome tradition for many area residents and visitors. This traditional winter event features an ice castle sculpture as its centerpiece, and events include snow and ice sculptures, art shows, outdoor concerts, sled dog races, and robotic snowplow competitions where inventors employ their robotic masterpieces. Your next opportunity to check it out is January 24th-Febrauary 2nd 2019. Steamboat Springs Winter Carnival: For a taste of the true Old West, this Colorado winter carnival offers horses as the main attraction. 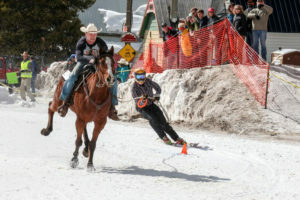 With everything from shovel races with adults on shovels being pulled down main street behind horses, skiers jumping through fiery hoops, ski jumping competitions, slalom races, cowboy-assisted skiing events, a biathlon involving the wearing of vintage fur trapper attire and shooting muzzle loaders, and the “lighted man” (a skier who slaloms down a dark mountain with roman candles and rockets shooting from his costume), this unique winter event is a great way to spend a fun week in beautiful Colorado and help locals and visitors to this unique western mountain town celebrate over 100 years of winter tradition with the oldest continuous winter carnival west of the Mississippi. Check it out February 6th-10th 2019. Plunge Fest: If you have always wanted to be part of the polar bear plunge crowd, you’ll be in great company when you visit Annapolis, Maryland for Plunge Fest, the biggest polar bear plunge of them all. More than 10,000 plungers visit Maryland annually for this dash to dive into the freezing waters of the Chesapeake Bay in the middle of winter. Proceeds from the annual event benefit Maryland’s Special Olympics, and there’s even a “Super Plunge” team, an elite group of (some say crazy) individuals who not only commit to raising $10,000 individually, but will brave the Bay every hour on the hour, for a total of 24 plunges in 24 hours. If you prefer to stay dry, you can visit the carnival featuring giant sand sculptures and live music. Jump in January 24th-26th 2019. Fur Rendezvous: To help break the monotony of the extra-long Alaskan winter, Fur Rendezvous was started back in 1935 in Anchorage, Alaska, with sports, games, and even a torchlight parade. Today, the festival is known as “Rondy” and has grown into a 10-day celebration of Alaskan life featuring men’s snowshoe softball, a grand prix auto race, a “running of the reindeer” event, an native arts market, and a “blanket toss”—a native Alaskan tradition in which a person is tossed from a blanket high into the air to scan the ocean for whales. The world championship sled dog race is the cornerstone of the festival, which includes a fur auction and attracts teams of sled dogs and mushers from all over the world. Head north February 22nd– Mach 3rd 2019. Saranac Lake Winter Carnival: Winter in the Adirondack wilderness can be long and monotonous. To help liven things up, the locals instituted what has evolved into the longest-running event of its kind in the eastern U.S. The Saranac Lake Winter Carnival boasts typical winter sports like Nordic skiing and ice skating, but also hosts unusual competitive events like ultimate arctic frisbee and a women’s frying pan toss. The biggest draw of this festival is the famed ice palace—a mammoth structure made with anywhere from 1,000 to 3,000 ice blocks, weighing up to 800 pounds each. Look for the “IPW 101” carved somewhere on the walls of the ice palace every year; it represents “International Palace Workers 101″—an inside joke among the people who build the palace each year. Join in February 1st-10th 2019.